5 Easy Energy Saving Tips From Your HVAC Contractor | GSK Climate Control, Inc.
1) Buy a Programmable Thermostat & Utilize the Scheduling Feature: Wi-Fi connected “Smart” Thermostats make energy efficiency easy to achieve and convenient by automating scheduling functions while maximizing and controlling the climate within your home. Do you often forget to turn your thermostat down when you’re not home during the heating season or up during the summer!? Not doing so, wastes a ton of energy and money! For example, turning down your thermostat 10 degrees while you’re at work during the heating season, can save you 14% in heating costs. Following a similar procedure during the cooling season will produce the same savings! Your house doesn’t need to be over-conditioned when no one’s home – this will lower your utility bill and put extra cash in your wallet that would’ve otherwise been wasted! Smart thermostats have scheduling features that once programmed, will automatically turn down at specified times and days. Another convenience of having these thermostats is the remote capabilities. This is what makes smart thermostats appealing to second-home owners. Every smart thermostat on the market has an app for that! So, even if you forgot to schedule your thermostat, or left for vacation and don’t want to run your normal schedule, you can remotely access the settings and features on your thermostat from your mobile device! Smart thermostats can also be programmed to email you alerts in the case of a power outage, high or low temperature alerts, filter reminders, and more. The latest smart thermostats even have “geo-fencing” features. If location is enabled on your thermostat’s mobile app, it can tell when you leave home and automatically turn down or up the temperature in your space to maximize energy savings. It can then tell when you’re within a certain radius (often within miles) of your house and turn your temperature settings back to an occupied level, ensuring your home is comfortable by the time you arrive! There have been multiple studies, proving programmable thermostats are not only economically viable but have quick ROI’s (returns on investment). Although smart programmable thermostats are pricier than their old-school counterparts (typically ranging from $100-$300 a piece), utility programs, such as Efficiency Vermont, incentivize the energy-savings provided by these thermostats by offering significant rebates. Efficiency Vermont will provide up to $150 cash back after purchase for each “smart” thermostat installed (with a limit of 2 thermostats per VT residential electric account)! If you’re buying thermostats through your contractor most of their wholesalers will provide the rebates at the time of purchase, saving our clients from having to fill out the rebate forms themselves and further simplifying the process! Click here for more information on Efficiency Vermont’s Smart Thermostat Rebate. If you’re interested in reading more about Smart Thermostats, check out our previous blog post on the subject! 2) Schedule Bi-Annual Preventative Maintenance (once before the heating season & once before the cooling season): Getting your heating and cooling system tuned up pre-season is just as important as scheduling those routine oil changes and tire rotations for your car. You can’t expect your car to run correctly for the next 100,000 miles if you don’t routinely maintain it’s parts – well, your HVAC equipment is no different! Your HVAC system is a substantial and important investment in your home that also impacts a large portion of your energy expenses. An in-expensive bi-annual investment in Preventative Maintenance ensures your system is running efficiently and economically so you can enjoy uninterrupted comfort and avoid inopportune and often-times costly repairs that could have otherwise been prevented. Preventative Maintenance ensures you’re getting your money’s worth out of the system – saving you energy and money on your utility bills, while providing optimum comfort and health! Buildings that regularly maintain their HVAC equipment use 15-20% less energy than those who allow their systems to retrogress until an obvious problem occurs. According to the Department of Energy, 25-40% of the energy consumed by heating and cooling systems is virtually wasted due to various contaminants and debris built up in your system over time, hindering it’s normal operation and functioning. It’s important to note that un-maintained equipment negatively impacts the lifespan of your system and can also void warranties! For more information on what a Preventative Maintenance visit consists of, check out our previous blog on the Importance of Preventative Maintenance to learn more! 3) Regularly Change/Clean Your System’s Air Filters: It’s important to acknowledge the simple fact that ALL OF THE CONDITIONED AIR PASSING THROUGH YOUR HOME IS PASSING THROUGH YOUR SYSTEM’S AIR FILTERS! If your air filter is plugged up with dirt, dander, pollen, mold spores, VOC’s, you name it, you are constantly breathing all of those contaminants in your home! Ask anyone what’s fundamentally most important to them and their family and they will most likely list: health, safety, and comfort. Dirty, forgotten, un-changed air filters can easily become a prime source of pollution in your home – severely impacting your home’s air quality, exacerbating respiratory and other health issues, and ultimately contaminating your indoor environment. The purpose of the air filters in the system is to capture and trap any particulates that could accumulate in your HVAC system. When your filter is dirty, contaminants can pass through to your system, accumulating on fan blades and heat transfer coils, impeding performance, causing the system to use more energy and work harder, and ultimately hindering the unit’s ability to heat or cool your home. A layer of dust merely two one-thousandths of an inch thick on a heat transfer coil such as your furnace’s heat exchanger, your indoor unit’s evaporator coil, or your outdoor unit’s condenser coil, can reduce your system’s efficiency by 10%! It’s important to change your air filters at least every three months, or every month! For those of you with heat pump systems, your filters are most likely washable. Take the filter out of the unit, rinse all the debris out with warm water, shake or pat dry, replace, and you’re good to go! If you’re not sure where your filters are, make sure to ask your HVAC professional! Changing your filters is the easiest, most inexpensive, and effective way to safeguard your system and your family’s health!! 4) Find & Seal Leaks in the Building Envelope: Do you notice obvious drafts in your home during the winter? Or, are certain rooms always hotter in the summer? Using silicon caulking and weather-stripping to seal air leaks around old windows and doors can make a significant difference in maintaining the thermal efficiency of your home and improving your comfort. Caulking is typically used around stationary house components, such as door frames and window frames, or around electrical conduit and piping penetrations. Weatherstripping is effective for sealing components that are operable, i.e: doors and windows. If you notice considerable drafts around the bottom of your door(s), replacing leaky door gaskets is another easy, inexpensive, and effective fix. Ensuring your home also has proper insulation, free of asbestos and other carcinogens (if your home is was built pre-1980’s, before asbestos was banned from building materials) is an extremely productive strategy to cutting your heating and cooling costs (as well as protecting your family’s health), as it minimizes outside air penetration and conditioned air from leaking out of your home. In older homes when extensive air leaks are sealed, you may have to consider adding mechanical fresh air ventilation with an HRV (Heat Recovery Ventilation), or ERV (Energy Recovery Ventilation) system, which provide fresh air and exhausts stale contaminated air. Check out the Department of Energy’s Air Sealing Guide for more information! 5) Replace Out-Dated Equipment: Replacing HVAC equipment over 10 years old, can prove immediate energy savings, as newer high efficiency systems are up to 50% more efficient than their out-dated counterparts. In the last decade the HVAC industry has innovated electronically-commutated (ECM) motors, variable-speed drives, wi-fi enabled interfaces, and inverter-driven compressors, while increasing government and federally-mandated SEER and EER efficiencies – just to name a few- all of which have significantly increased equipment efficiencies and operation from the decade prior. If your unit is 10 years or older it may be time to consider replacing it! The returns on investment (ROI) for this new equipment is often realized within a few years, after which all of the energy savings goes right to your wallet! Not to mention, the purchase of new high-efficiency HVAC products such as heat pumps, furnaces, boilers, water heaters, high-performance circulator pumps, and ventilation systems have all been incentivized with significant rebates through utilities such as Efficiency Vermont! Check out the potential savings and rebates for yourself, on Efficiency Vermont’s Available Rebates page! 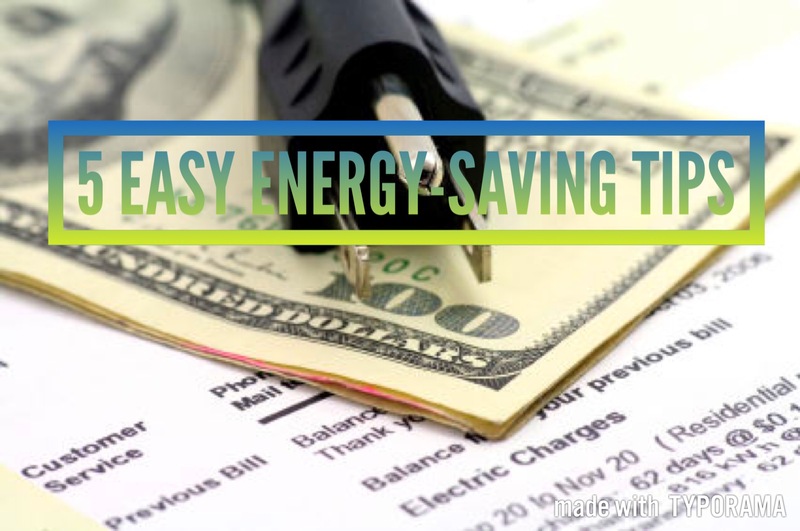 Utilizing these 5 Easy Energy Saving Tips will help you achieve increased efficiency and energy-savings on your home’s Heating, Cooling, and Ventilation systems – drastically reducing your utility bills while benefiting both your wallet and the environment! Enjoy & thank you for reading! ‹ GSK Employees Treated To Fresh Off the Griddle Breakfast Sandwiches! !